This green 94 Defender came to us for a general tidy up. The frame had a few holes & some rust but has some life left in it. The suspension & axles were very rusty. The top had shrunk badly & came nowhere near fitting. The interior was in poor shape. The left hand front wing was dented. The customer had a specific budget in mind so we focused on the items that gave the biggest cosmetic & mechanical improvement for the money. First off we started on the underbody improvements. The fuel tank was removed & the rear x member & fuel tank supports were sand blasted. Where necessary the fuel tank supports were repaired. The x member itself was solid. After blasting the rear x member was painted & undercoated. A common problem is the fuel pump lines rust very badly. While most of the pump is plastic the two short metal lines that are part of the pump rust & make the pump useless. We installed a new pump & put the tank back in place with a new galvanized skid plate. New stainless steel fuel lines were fabricated & installed. All the axles & suspension & fuel system were stripped out of the defender. The axles & suspension were sand blasted & repainted with a paint far superior to the factory finish. The axles were completely stripped & rebuilt. All the suspension arms were rebushed prior to installation & new HD spring & Bilstein shocks were used. 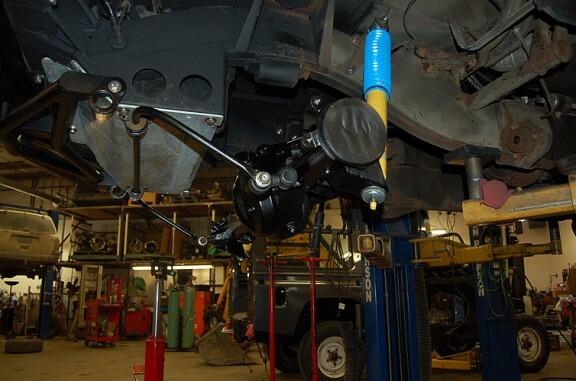 Together with new steering tie rod ends & an alignment this makes the defender drive much more precisely. The frame was repaired in a couple of places. It is very common to see holes behind the gearbox x member as dirt is trapped between the two surfaces. Another area of common rust on defenders is the roll cage supports, rear step & rear tire carrier. All of these were sand blasted & painted. Some of the roll cage supports needed repair. If just a mounting flange is rusty, we often repair the support, but if the tube has been compromised by rust we install a whole new support. Plastic shims are cut & installed where steel meets aluminum, together with quality paint & undercoat this forms a barrier between the steel & aluminum & stops the dissimilar metal corrosion. A new inner & outer fender was painted & installed. The rest of the body was carefully buffed to bring back the paint. We also buffed off the pin striping & repainted the sills where they had been painted black. This gave a much cleaner & more original look. While not a perfect match the defender looked very good for a reasonable cost. The interior got new seats front & rear. New mats were also installed along with a new center cubby box. Even though this was not nearly a restoration, the tidy up gave this defender a whole new lease of life. The Badger soft top also helps keep out the elements to a greater degree than the factory tops ever did.